Encrypt Files and Folders | How to Encrypt a File or Folder in Windows 7? Do you know that you can encrypt files and folders in certain editions of Windows 7? If you are not sure, encryption is the process of converting data file into a format that cannot be read by others. Yes, if you are using Windows 7 Professional, Enterprise, or Ultimate editions, it have the ability to encrypt files and folders so that they cannot be read without the key to decrypt them. The key is attached to the person who performed the encryption. When she or he logs on to the computer, the files can be used as if they were not encrypted. If someone else logs on, the files cannot be accessed. Even if someone takes the hard disk drive to another computer, all that will be displayed is gibberish. Click Start button and click Computer. From the window displayed, open the drive and folders to display the files that you want to encrypt. Right-click the particular file, and choose Properties. From the file Properties dialog box displayed, in the General tab, click Advanced button. From the Advanced Attributes dialog box displayed, check the Encrypt contents to secure data option. Click OK to close the Advanced Attributes dialog box. Click Apply button and you will see an Encryption Warning dialog box stating that the file is not in an encrypted folder, which means that when you edit the file, temporary or backup files might be created that are not encrypted. Click OK to accept the default setting. Click OK again to close the file Properties dialog box. From the window displayed, open the drive and folders to display the folders that you want to encrypt. Right-click the particular folder, and choose Properties. From the folder Properties dialog box displayed, in the General tab, click Advanced button. Click Apply button and you will see a Confirm Attribute Changes dialog box that asks if the change applies to this folder only or applies to this folder and its subfolders and files. Choose the option you want, and click OK.
You may see a message from the Encrypting File System in the notification area that you should back up your encryption key. Click the icon in the notification area. 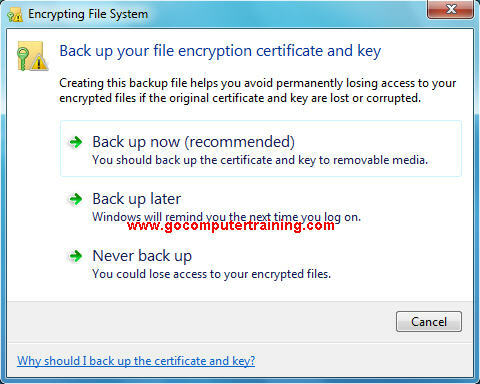 From the Encrypting File System dialog box displayed, choose how you want to back up your key. The title under the file or folder icon turns a different color, normally green. As you can see, encrypt files and folders in Windows 7 are pretty simple and straight forward but it's definitely important if you are working in a computer with multi-users.